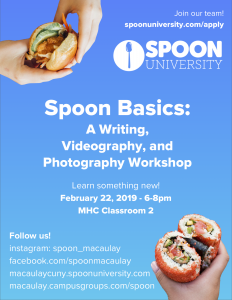 Join Spoon Macaulay in learning about writing, videography, and photography! This workshop will be based on the principles we use in order to guide new members into the Spoon Community. This event is also open to any Macaulay student interested in joining the club or learning about writing, videography, and photography. Pizza will be served!